TANA: Thank you for joining me, Alessandra. After pouring over your book during my long minibus commutes around Cape Town, I’m sitting with lots of questions and reflections for us to explore. 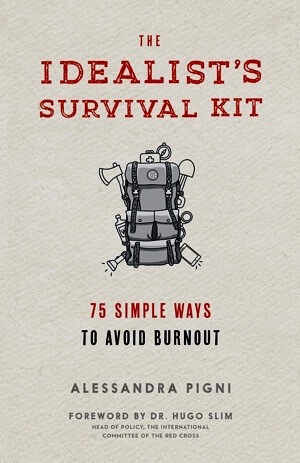 For starters, I’m curious to know what inspired you to write a book on burnout in the humanitarian aid sector? ALESSANDRA: The inspiration came from my own experience as an aid worker. I first worked with Doctors Without Borders in Palestine where I was lucky to have strong supervision and a space for reflection. It was a privilege actually because in that job, as a psychologist dealing with an intense caseload, I was entitled to the support. But during my second stint, when I worked in China, that option wasn’t there any more. That’s when I realized how important this kind of organizational support and care was. I remember the coordinator of the project saying that all aid workers need it; it doesn’t matter if you are a psychologist, field coordinator, or senior manager. ALESSANDRA: My colleagues and I were of course affected by the stories of political violence and trauma, but that wasn’t really what created the big problems for us. It was what was happening in our organization that got to us the most. There is all this talk of trauma and post-traumatic stress disorder in humanitarian aid work, but in my experience the assumption that this is what is causing burnout is a myth. I didn’t see many aid workers who were psychologically traumatized. Of course there are critical incidents in the field that can be traumatic, but for the vast majority of people when they go through those incidents they don’t develop post-traumatic stress disorder. TANA: Your book is chock full of examples of aid workers sharing similar observations to yours. One that sticks out in my mind is from a senior head of missions with decades of experience in the field, spanning many countries. He says: “With all the atrocities I have seen, actually the most difficult things have been team dynamics! I lose more sleep over these kinds of personal dynamics than by seeing bodies and wounded people…. I understand that I have no control over war, instead when it comes to team dynamics I have the expectation that I can solve them…. You cannot mitigate certain external events like armed robbery, but by addressing management issues you can alleviate a lot of stress.” How did you gather so many quotes and stories from the field? Did they all come from your own work experience? ALESSANDRA: After putting together the structure of the book, I spent a few months in southeastern Turkey on the Syrian border interviewing Syrian and international aid workers about their experiences working on the Syrian crisis and what affected them. I conducted around 35 formal conversational interviews as well as some focus groups, but I talked informally to many more people. I really immersed myself in that reality, living and socializing with aid workers as a participant observer. TANA: You are very direct and unapologetic in naming the role that organizations play in contributing to burnout in the field. How have people managing and working in humanitarian aid organizations responded? ALESSANDRA: For me the reaction has been almost like receiving love, which sounds really strange, but the response has been extremely warm, starting with the book launch, which was held at the headquarters of the International Committee of the Red Cross (ICRC) in Geneva. The room was packed with around 150-200 people from across the NGO and United Nations world. They were really interested and engaged. They asked lots of questions and bought the book for themselves and their colleagues. It seems that the issues the book raises had already been in the back of people’s minds. They just felt isolated, thinking “It’s just me, I better not say anything.” So they appreciate that I am openly naming what they are experiencing and saying that it is within our power to change things. I also think they appreciate that I’ve raised the issue in a way that doesn’t blame and shame them, but instead recognizes the difficulties they are facing in the field and at headquarters. TANA: Before we go further into the conversation, I’d love to get clarity on what you mean by the term ‘burnout’. In the book you say that “burnout dies in a caring and trusting environment. Burnout is finished when there is respect and civility at work.” However we’ve found that burnout is rampant even in the most engaging and meaning-filled organizations we’ve come across. It seems that they experience burnout as a result of feeling too connected to the meaning of their work and to their colleagues. They struggle to say no when the work starts piling up because they are so passionate about what they are doing. ALESSANDRA: At one point in the book I talk about the importance of experiencing joy in your work. If you have meaning but no joy, you definitely run the risk of burnout. TANA: Yes, I do remember that. Actually I highlighted a quote from that section in my notes: “How many unhappy souls with a sense of purpose are out there? ‘To live only for meaning,’ Chris Hedges warns us, ‘indifferent to all happiness— makes us fanatic, self-righteous, and cold. It leaves us cut off from our own humanity and the humanity of others. We must hope for grace,’ he writes, ‘for our lives to be sustained by moments of meaning and happiness, both equally worthy of human communion.’ Happiness withers if there is no meaning. For a long while I traded meaning for happiness.” However, in the engaging organizations I’m thinking of, joy and connectedness is an everyday experience. ALESSANDRA: Then I would say that what they are experiencing is exhaustion, not burnout. Burnout is when you’re totally depleted mentally, physically, emotionally and spiritually. It’s when you have just had enough and are feeling quite cynical about your work. It’s difficult to pin down where exhaustion ends and burnout begins. When people say that they love their job and wouldn’t want to work anywhere else, but they’re really tired and need a break, that’s not burnout. TANA: The distinction between exhaustion and burnout is really helpful. Too often we blame exhaustion on an individual’s inability to manage their time well or to create boundaries for themselves, but in my experience organizations often say yes to too many things and underestimate the time it will take for their staff and volunteers to do the things they’ve committed to, at least in a way that won’t lead to exhaustion. ALESSANDRA: I agree. Organizations cannot hire one person for a job that requires three people and wonder why the person is exhausted or not able to deliver everything that needs to be delivered. I’m shocked at the number of people who, after working a whole day, go home, eat something quickly, and go to work again. It is great that many cultures are at the stage where work is about fulfillment and not just about paying bills, but the idea that I get my fulfillment and identity just from my work is absolutely crazy. You strip people from their profession and they don’t know who they are. TANA: So true. I can relate to that myself. I imagine that the process of writing a book is a learning journey in itself. Did you experience any shifts in your thinking while writing the book? ALESSANDRA: Yes, I would say two things shifted for me. The first is that my tone changed. After I wrote the first draft, I took a long break, and when I came back to it with fresh eyes, I realized it was quite judgmental in tone. It was clear to me then that I didn’t want to be this person who is telling people how to fix things. I wanted to come to things with a more empathic outlook. So I wrote the second draft with this spirit. I also found myself taking a more relational approach to the topic. When I was writing my blog I was working from the assumption that ‘changing the world’ starts from within individuals. However while writing the book, I began to see that changing the world starts in our relationships with each other, as well as within ourselves. ALESSANDRA: I no longer believe that meditation and self-care are enough. It can certainly be a starting point. It was for me. But we can’t stop there. Otherwise it just becomes narcissist self-care. I always say that I can meditate until I’m blue in the face, but if my manager or the organizational culture is toxic, my mindfulness will help me cope for a while or help me make the decision to leave, but it is not going to transform the organization. Things have changed quite a bit since I started writing my blog back in 2010. Mindfulness is everywhere now. It has become a commodity. There are so many consultants out there giving trainings on stress management, burnout, and resilience. But I think some are missing the point. A workshop can be a helpful catalyst, but in itself it won’t necessarily change an organization’s culture and way of working. It seems to me that organizations run the risk of wasting their money on once-off trainings. Fostering a learning and caring work environment is the most effective approach to burnout prevention. The most successful organisations are the ones who try and practice within the values they hold dear vis-a-vis the community they work with. TANA: In the book you say: “Self-care places a great deal of responsibility on the individual, and (yet again) lets the organization off the hook. Asking aid workers to practice self-care so they can survive in tough or toxic work environments implies that beyond paying for a bit of training and counseling, organizations have no other role to play in contributing to the well-being of their staff (and hence the world).” It seems like the problem is when mindfulness is framed or introduced in a way that is separate from our work relationships – when it is seen as an individualized practice, rather than a relational practice. For me mindfulness in an organizational setting is about how we work together more consciously. How do we enter our next staff meeting with more presence, openness, and empathy? I’m wondering if there is a role for psychologists in helping aid workers do this. How might organizational development practitioners and psychologists collaborate to have a greater impact? ALESSANDRA: I certainly don’t have a ready-made answer, but it’s something I’ve been thinking about as well. I think it would be quite generative to bring coaching, mentoring, psychology and organizational development expertise into dialogue with each other. Not to simply design trainings and workshops, but to deeply explore the possibility of doing something different. However the most important people to engage are the people actually working in organizations, because they are the ones who will bring about transformation. TANA: This is where the field of psychology might be quite useful- in helping us understand the deep psychological barriers that are holding people back from transforming their organizations. I find it fascinating that here you have people who are willing to risk their lives working in areas of conflict, war, and disease and challenge systems of injustice, but these same people don’t feel brave enough to challenge the system they are closest to – their own organization. Perhaps the field of psychology can help us understand why this block exists and how to move beyond it. ALESSANDRA: I think one of the important things psychologists can do is send the message that burnout is not a pathology or mental health disorder, but a symptom of an unhealthy organizational context, which is within our collective power as human beings to change. TANA: It’s like the dynamics around poverty. Poverty causes lots of people to break down, but it’s not the people who are broken, it is the system that is broken. Perhaps there is a role of accompanying people as they start to experiment and tinker with changing their organizations. ALESSANDRA: Yes, I think the accompaniment role is an important one- being there to enable people to be agents of change within their organizations- giving them the tools, but mostly the courage, to say ‘we want to transform this’. I think it is really helpful to have someone on the outside- a psychologist or consultant- the label doesn’t matter. It’s the relationship of support that matters. As far as I’m concerned it can be someone with no training in psychology, but with a capacity to relate to people. Just having someone you can go back to and have a conversation with and say “Hey, this is what’s coming up. Let’s talk about it”, a space where we can take off our masks and say “This is what is really going on for me.” That said, it does depend on the organization you are in. In the humanitarian system, there are huge organizations where the individual is just a cog in the machine. The attitude is, “If you don’t like it, go somewhere else.” It feels almost impossible to have agency in such an environment. I’ve given up on these kinds of organizations. TANA: I can imagine that the barriers in these organizations can feel insurmountable, with all the bureaucracy and paperwork involved to get even the smallest change implemented. But isn’t it in our nature as activists to work from the grassroots and not assume that it is only those in positions of power whose job it is to change things? Shouldn’t we take this same approach in our organizations? Not just demanding transformation, but being part of practicing transformation. At one point in your book you say: “prevention and care for ourselves and others starts with each one of us…each one of us can contribute to the psychosocial health of the team. If you are waiting for HR to start the process, you may be in for an endless wait.” What can people do at the grassroots level that doesn’t require budget approval and paperwork from those in positions of power? ALESSANDRA: It’s not an easy question but it’s an important question. It’s the question that accompanies me everywhere I go. I don’t think there is one single answer otherwise we would all just get the recipe and do it. For starters, I think it’s important to focus on the small things we can do every day and to cultivate this practice in the organization. I like the metaphor of seeing your organization as a garden. You can let it grow wild or every day you can do some gardening and tending to the plants. And that’s done through small acts of care, love and attention. That’s what makes a work environment humane, a place where people want to hang around and be their best. TANA: It seems like most of the examples you give in the book are of people who are frustrated and don’t feel they have agency to change things. Did you also come across examples of people who were feeling they were making some inroads, even if small? ALESSANDRA: It’s true that for the most part I spoke to people who were frustrated and not feeling empowered to change things. The most successful thing they felt they could do was to move on. But I can think of a few examples. I did some work with an NGO that was very keen on transforming itself. I worked with them for a long time and they had lots of constraints. But they were doing what they could and allowing things to shift when possible. When I went back to visit, months after we ended our work together, some of the results were quite symbolic, simple things like a coat of paint. Part of me thought, “Is this the work of a psychologist – to encourage people to paint their walls?” Maybe not, but people were much happier to work in that more welcoming environment. We all know how the external environment has an impact on how we feel. They were engaged in a bigger process of transformation, but it started with small things. Starting small is good, it gives you a sense that you can shift things because you can see some immediate results. TANA: I’ve certainly had moments like that. On the flip side, a number of years ago I found myself in a really challenging work environment. All of us in the organization had good intentions and were trying our best to change things, but we really struggled. However, despite our struggles which had me coming home in tears on numerous occasions, I knew intuitively that I wasn’t meant to leave. And it ended up being one of the most amazing learning experiences I’ve ever had and has informed a lot of the work I’ve done since then. So it’s worth taking the time to explore if a difficult organizational reality is something you need to escape or stick out for the sake of your own learning and development. “How many people do you know who have had malaria or have caught some tropical infection in the field and have no problem sharing their heroic story of fatigue, vomit, or diarrhea around the dinner table? I wish people could talk about burnout with the same confidence. Because the reality is that more do-gooders “catch” burnout than malaria. Thank you Alessandra for writing this book and for taking the time to dig into the content with me. Perhaps there is a role that Organization Unbound can play in helping you bring a stronger organizational lens to addressing burnout in the field. Let’s keep the conversation going. If any insights or questions have arisen for you that you feel inspired to add to the conversation, we hope you will take a moment to share them in the comment section below. To purchase a copy of Alessandra’s book, go to Amazon.com. Available in paperback and ebook.